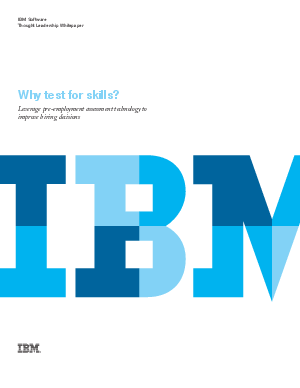 > IBM > Why test for skills? In an era when human resources departments are constantly being asked to do more with less, it’s clear that something needs to be done. As more and more resumes pile up for each position, HR teams need help to make a quality hire quickly. Fortunately, IBM Smarter Workforce technology can help, by providing companies the ability to test candidate skills at the beginning of the hiring process. Using simple and convenient skills assessments, it’s easy for HR departments to separate the serious candidates from the rest of the applicants. Once this is done, considering the candidates and making a quality hire becomes much more manageable.